Abduwali Abdukhadir Muse apologized for his actions and blamed the incident on the Somali government. 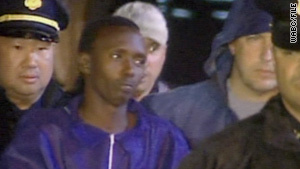 New York (CNN) -- A Somali pirate who prosecutors say led the attack on a U.S. vessel off the coast of Africa last year pleaded guilty in New York on Tuesday to charges he hijacked the ship and kidnapped the captain. Dressed in a dark grey prison uniform, Abduwali Abdukhadir Muse entered federal court in New York with his head down and his hands behind his back. He pleaded guilty to felony counts of hijacking maritime vessels, kidnapping and hostage taking, for his role in the hijacking of the U.S.-flagged Maersk Alabama in the Indian Ocean on April 8, 2009. Muse faces a maximum sentence of almost 34 years behind bars when he is sentenced on October 19. Prosecutors say Muse acted as the ringleader when he and three other men seized the Maersk Alabama by force about 350 miles off the coast of Somali. Once on board the armed men demanded the ship be stopped, then took a life boat and held the captain of the ship, Richard Phillips, hostage on it. Through an interpreter Muse apologized for his actions and blamed the incident on the Somali government. "What we did was wrong. I am very sorry for all of this," Muse said in a soft voice. "All of this happened because of the government in Somalia," he added. Muse's actual age has been a subject of debate since his arrest last year. His lawyers lost their bid to have the diminutive, baby-faced pirate tried as a minor. On Tuesday he agreed not to challenge the finding that he is not a juvenile and to be tried as an adult. In addition to the Maersk Alabama, Muse was charged with participating in the hijacking of two other vessels in late March and early April of 2009. Muse told the court that he and the three other men agreed to "capture any ship that came by." He added that he did not recognize the U.S. flag on the Maersk Alabama. Muse and his cohorts held Philips hostage for four days in the life boat. The USS Bainbridge, a U.S. Navy destroyer, came to the assistance of the vessel, and in radio communications, the pirates threatened to kill Phillips if they were not guaranteed safe passage away from the scene, authorities have said. Four days after the hijacking began, Muse boarded the Bainbridge and demanded safe passage for himself and the others in exchange for Phillips' release, according to a criminal complaint. While he was away from the lifeboat, Navy SEALs shot and killed the three remaining pirates, authorities said. Muse was then taken into custody.